Why point out a fault in Siva that he took gangA which has connection with the divine feet of emperumAn on his shining matted hair? He is being called Isvaran (one who controls) and is responsible for the function of destruction. AzhwAr says that he got the quality of being Isvaran because he is the body (SarIram) of emperumAn and not of his own nature. pon thigazhum mEnip puri sadai – having a physical form shining like gold and having platted, matted hair. am puNNiyanum – Siva did penance beautifully and observed means by himself. emperumAn has a comfortable form resembling dark clouds [being magnanimous, ready to pour benefits on everyone]. The golden form of Siva which is like fire, indicates that his form is the exact opposite of emperumAn’s. That Siva is different from emperumAn is brought out by his matted hair, which is the exact opposite of the long crown that emperumAn has. From these two verses, it is clearly mentioned that emperumAn is superior to Siva in every way. am puNNiyanum – mahAbhAratham SAnthi parvam 20-12 says “mahAdhEvasarvayagyE mahAthmA hUthvAthmAnam dhEvadhEvO babhUva” (rudhra, the mahAthmA (great soul) in the sarvayagya (a kind of ritual) offered himself as the havis (a material which is given as an offering during the ritual) and became a dhEvadhEvan (dhEva among the dhEvas)). Due to the grace of emperumAn, rudhra (Siva) who had carried out sinful deeds, reached an exalted state and hence AzhwAr calls him as puNNiyan (one who has done virtuous deed). ninRu ulagam thAya nedumAlum – emperumAn had carried out many exalted deeds, as per his desires. He is also the sarvESvaran (Lord of all) who kept his divine feet on the heads of Siva and others, without any distinction. oruvan oruvan angaththu enRum uLan – one (Siva) is the body of another (nArAyaNa) and exists. 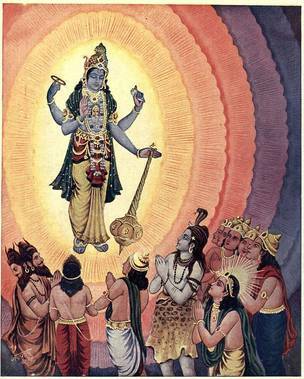 Or, one (Siva) would reside in a part of the divine form of the other (nArAyaNa) and have his existence. Hasn’t nammAzhwAr mercifully said in thiruvAimozhi 1-3-9 “valaththanan thirupuram eriththavan” (the one on the right side of emperumAn’s divine form is Siva who burnt the three towns)! Thus, hasn’t nammAzhwAr mercifully said in thiruvAimozhi 4-10-3 “paran thiRam anRip pallulagIr dheyvam maRRillai” (there is no other deity without being under the control of emperumAn)! [the inference is that this 98th pAsuram of poygai AzhwAr is the root for nammAzhwAr’s pAsuram in thiruvAimozhi 4-10-3]. We shall consider the 99th pAsuram next. This entry was posted in iyaRpA, mudhal thiruvandhAdhi on September 19, 2017 by T N Krishnan.